RocketTheme have only gone and released a bonus theme this month. 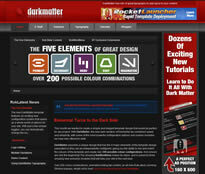 It's based on the theme released for June, Elemental but it's called darkmatter. It's basically the same, from what I can see, but it comes with loads more colours. If you're into your dark colours and you're looking for a theme to get your site started with then this really can be used for pretty much anything. It comes with never before seen modules and access to every other theme released by RocketTheme. You've got the best themes club support in the industry and for what you pay in cash it can not, I mean this, be beat.